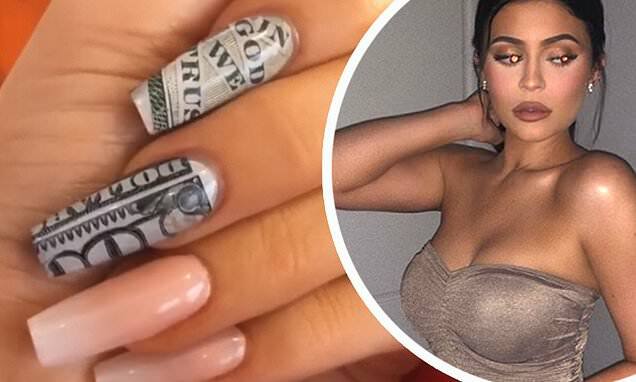 And Kylie Jenner flaunted her new status by decorating her fingernails with $100 bills. The 21-year-old showed off her new nail wraps on Thursday, sharing pictures to her Instagram Stories. 'Till my fingers blue,' she wrote alongside the post. The brunette recently became the world's youngest billionaire thanks to her successful make-up company Kylie Cosmetics - valued at least $900 million. Kylie has insisted that despite coming from a famous family her fortune is entirely self-made. Speaking to Germany's Interview magazine, she said: 'There's really no other word to use other than self-made because that is the truth. That is the category that I fall under.